METHODS: All patients who underwent pelvic reconstruction following APR with either VRAM or omental flaps from January 1992 - January 2017 were retrospectively reviewed. Patient demographics and relevant comorbidities including chemotherapy and radiation therapy data were collected and analyzed. 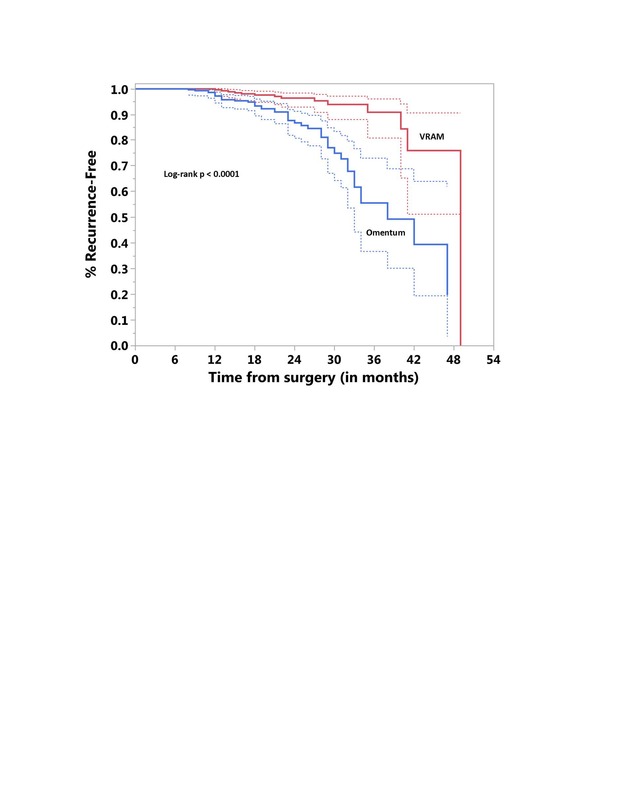 In addition, margin status at the time of oncologic resection was analyzed. Flap-specific data were collected for each approach. Oncologic data collected includes cancer type, stage at time of APR, and rate of tumor recurrence within the flap. RESULTS: A total of 562 patients were identified who underwent pelvic reconstruction with either VRAM or omental pedicle flaps. Of these, 274 (48.8%) underwent VRAM reconstruction and 288 (51.2%) underwent omental flap reconstruction. All margins were negative at time of cancer ablation surgery. Complications data included: seroma [VRAM=2(0.36%); Omentum=32(5.69%), p<0.0001], wound dehiscence [VRAM=31(5.52%); Omentum=17(3.02%), p=0.022], abscess [VRAM=4(0.71%); Omentum=27(4.8%), p<0.0001], cellulitis [VRAM=2(0.36%); Omentum=10(1.78%), p=0.025]. Statistical comparison of tumor recurrence between these two reconstructive approaches showed a significantly higher recurrence rate in omental flaps compared to VRAM flaps (p= 0.000127). CONCLUSIONS: The results of this study suggest a significantly higher tumor recurrence rate in omental flap pelvic reconstruction compared to VRAM flaps. This knowledge has the potential to influence surgical planning and flap selection in pelvic reconstruction.